Since her first trip to the East in 1971 (when she was 21), Visakha's life has never been the same. She's tried to explain what happened to her -- and what's continuing to happen -- in numerous magazine articles as well as four books, most recently Five Years, Eleven Months and a lifetime of unexpected love, a memoir. The author’s insights, thought-provoking reasoning, and her account of Prabhupada and his movement reveal the spiritual journey of a young woman who starts questioning her lifestyle, goals, values, and identity. The narration is descriptive and the black and white photographs are starkly vivid - they capture the essence and mood of the author’s words. The way she has woven her story is simple, yet she manages to encourage readers to find their own spiritual path. 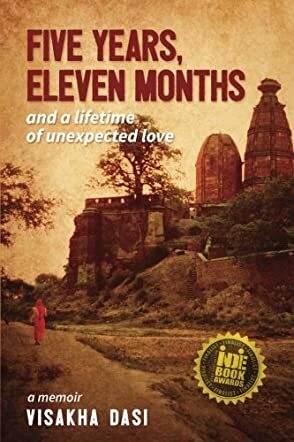 The book is refreshingly unique, the emotions are palpable through the words and pictures, and the struggles and obstacles undergone and faced by the author during her journey as a spiritual seeker make it a compelling and thoughtful memoir.